Today’s the day! Arizona’s 38 Miles for the Equal Rights Amendment begins today. I’ll see the marchers today at the noon press conference. Establishment forces are trying to silence ERA supporters at the Capitol. It’s time for us to stand up and fight for our rights. Arizona could make history in the coming weeks as the 38th state to ratify the Equal Rights Amendment. The ERA Task Force AZ has brought together many diverse groups of women and men to push Arizona into the history books. The ERA Task Force AZ is organizing a 38-mile, three-day march in Phoenix. Here are the basics for all three days. Come if you can. Wear white and good walking shoes!!! Monday March 11, 2019: We’ll meet and park at Phoenix First Church UCC 1407 N 2nd St, Phoenix, AZ 85004 at 10:30am and walk to the Capitol for a noon press conference. From the Capitol, we’ll hike past sites significant to women’s progress and end the first day at Sandra Day O’Connor House 1250 N College Ave, Tempe, AZ 8528 (13.8 miles). Tuesday, March 12, 2019: We’ll begin at 8:30am at Sandra Day O’Connor House, hike to the Piestewa Peak trail head then continue on to the office of Arizona’s first woman senator, Kyrsten Sinema 2200 East Camelback Road, Phoenix, AZ 85016 (13.5 miles). Wednesday, March 13, 2019: We’ll start 8:30am at Senator Sinema’s office, walk past Central Arizona Shelter Services and conclude at the State Capitol. 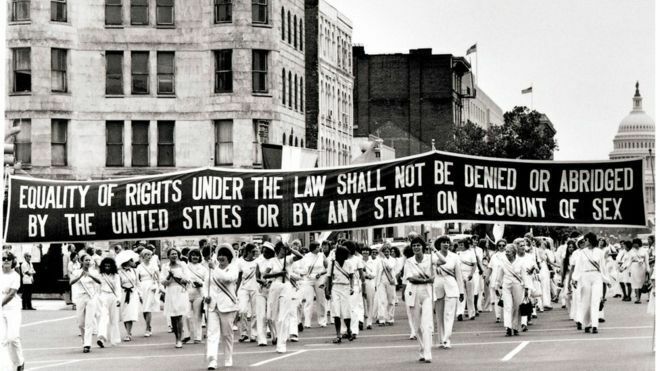 Do you want to show the world that you want Arizona to be the last state to ratify the ERA? Get a t-shirt here. Previous articleThe Climate Kids are coming!